The RT105 has a 107-hp (80-kW) turbocharged Tier 4 Deutz diesel engine which provides the power to perform all machine tasks on the toughest jobs. The new models – RT105, RT125 and the RT125 Quad tractor– each feature innovative control consoles and operator stations. Easy-to-read gauges and 120-degree seat rotation provide project visibility, while dial controls for ground and attachment operations provide the option to adjust power to each system, maximizing machine productivity. The re-designed workstations are equipped with 5-inch, colour LCD engine displays that rotate with the operator, providing direct visibility into all machine functions, including engine performance. The models also feature tilt steering columns and increased legroom reducing stress from long hours on the job. Operators will experience greater ease of operation due to upgraded controls. The RT105, and the RT125 and RT125 Quad are powered by 107- and 121-hp turbocharged, Tier 4 DEUTZ engines, respectively, for superior performance on any job. The tractors offer best-in-class ground clearance and standard four-wheel drive systems for enhanced maneuverability. Further improving performance, the RT125 Quad is equipped with a shift-on-the-fly, ground drive system that senses load conditions and automatically adjusts to meet individual jobsite needs. In addition, standard rear steer provides operators with superior turning radius and increased traction and flotation while digging. 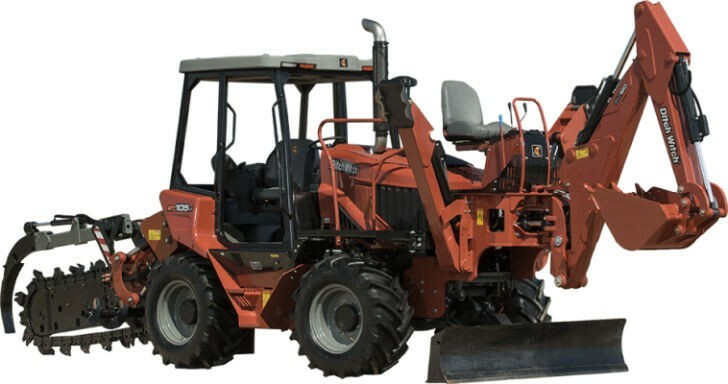 The RT125 Quad standard four-wheel drive makes the RT125 Quad the ideal heavy-duty tractor for both paved and off-road work. The RT125 comes with a 121-hp (90-kW) turbocharged Tier 4 Deutz diesel engine that keeps the RT125 running strong all day long.